North Central teen Josh Kaplan has been selected to serve as a National Child Awareness Month Youth Ambassador. 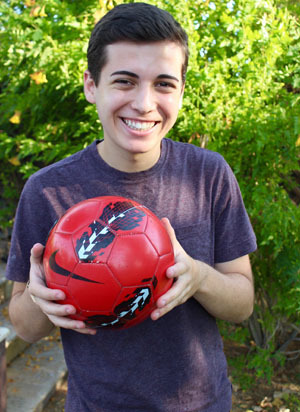 As one of 51 Youth Ambassadors selected from a nationwide pool, Josh will receive funding and training to lead an initiative to create the first soccer program in the greater Phoenix area for youth with and without intellectual disabilities. Josh Kaplan, a North Central resident, has been selected to serve as a National Child Awareness Month Youth Ambassador (submitted photo). Josh’s work begins in September—National Child Awareness Month—when he travels to Washington, D.C., for leadership training and meetings with members of the state’s congressional delegation. He then returns home to launch a campaign to overcome the stigma of children with intellectual disabilities through his soccer program. Josh’s program, entitled GOALS (Giving Opportunities to All who Love Soccer), involves youth ages 8 to 14, where each athlete is partnered with a buddy, who play together as a unit. This program creates positive peer-to-peer interaction while spreading the value of sports in everyday life. Josh, 16, was selected through a competitive application process, and chosen based on the quality of his project proposal and its potential to create substantive, large-scale change on behalf of young people in Arizona. Now in its eighth year, National Child Awareness Month is a program spearheaded by Festival of Children Foundation, in collaboration with YSA (Youth Service America), to raise awareness about issues affecting children. The 51 Youth Ambassadors will work in their communities, and form a collective network to raise awareness around issues important to young people. Youth Ambassadors receive a national-level platform for their cause; a $1,000 grant to develop a service project in his or her home state; ongoing training and project guidance; and networking opportunities with other Youth Ambassadors across the country. Josh is a junior at Rancho Solano Preparatory School and has been an avid soccer player since he first joined a team at age 7. He has been playing club soccer ever since. Last year, he created GOALS after his younger brother’s teammate, who had Down Syndrome, was unable to play on a regular soccer team. GOALS is a Unified soccer program in Phoenix that partners youth with and without intellectual disabilities for small field scrimmages, and is set to launch in the upcoming months. For this program, Josh recently attended the Special Olympics Social Impact Summit, a week-long training program in Los Angeles, where he joined 100 other youth from 30 different countries, all of whom have projects than generate inclusion for children with intellectual disabilities.